Looks like the biblical rain we’ve recently had has gone someway to refilling the reservoirs..
I’m surprised they’ve refilled this quick. Unfortunately, I could not see Grimwith, as I was up there, everything was choking on a layer of fog that was so thick, visibility was easily down to less than 10 meters. You can see in these photos, the bottom image was taken at Thruscross, the top at Grimwith. The Thruscross image, you can see the immense fog bank on the horizon. It was like driving into a alien world, like an invisible border had been crossed. I’ll spare you the rants about drivers not having lights on. 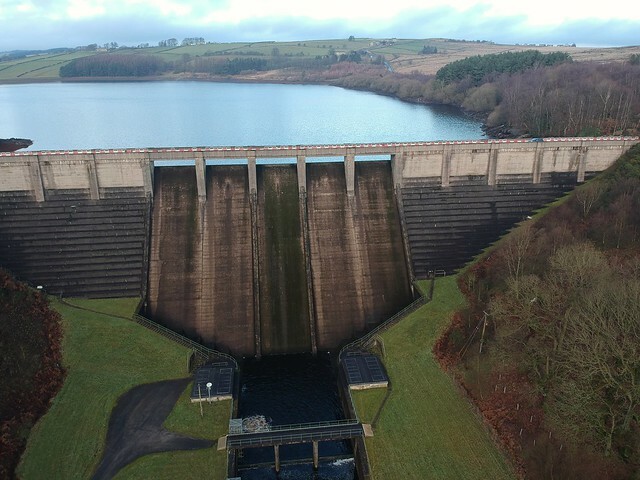 But anyway, a few good shots had of Thruscross dam, some piloting experiences amoung the trees. I do however want to get shots when this dam, and others are overflowing. Might need to wait a few more months for that though..
I’ve been wanting to get the shot for awhile, but the weather has been uncooperative for every day I’ve had off. But a brief lull in the rain got me up there. I rattled a few shots off, and then noticed the really low cloud base had started to roll in. The drone now reporting an altitude of -0.7m, the controller started beeping a landing warning, the cloud confusing its sensors. 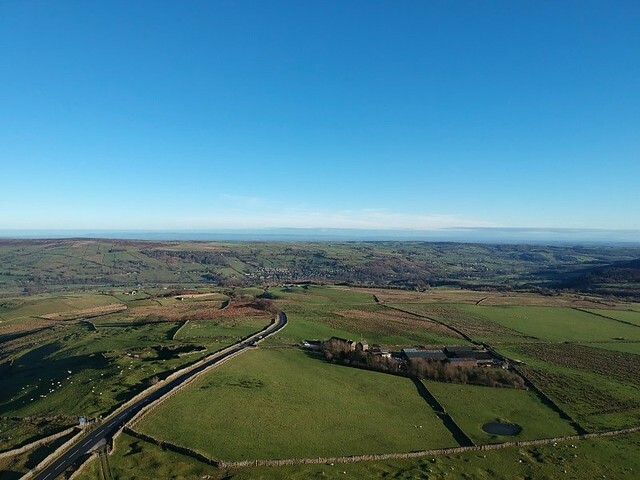 By the time I’d got the drone back and landed, I couldn’t see the hill or installation. But at least I had a few shots to choose from. The cloud had rolled in surprising quickly. It didn’t help with constant video breakups, as I was working with reduced range as I’d accidentally switched back to CE mode. But all in all, a good flight, and I’d got the image I wanted, but I do want to try a different angle taking more of the quarry into view. Maybe a rotating video too. A short film of our visit to Grimwith. I’ve been out here many times, but it’s the first time I’ve had the drone up. Despite shooting loads, there wasn’t really much to work with. So, enjoy this short video..
A walk round Thruscross with the Spark. Went for a walk with a willing Muse around Thruscross reservoir yesterday. Very cold, but enjoyed the company. My initial edit of the footage was done, and I liked the outcome, however I added a few scenes from the previous visits to Thruscross and extended it out by a few seconds for the second version of the edit.